Our vision is to see the greatest and fastest improvement to the health and wellbeing of the 2.8 million people in Greater Manchester. 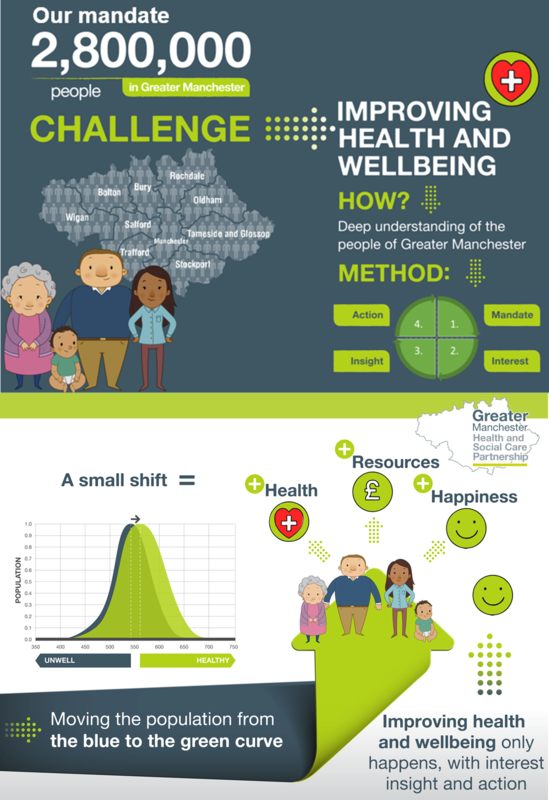 The draft Greater Manchester Strategic Plan set out, in December 2015, how we can achieve this through changes to our community services, to our hospital services, to our GP services, supported by changes to our IT, estates, workforce and other areas. Progress is already happening around improving and changing services and our “devolution deal” has given us the means, motive and opportunity to come together across Greater Manchester and do it quickly and at scale. Yet, we know that changes to our public services are far from enough to solve the huge health problems we have here. Ill health can be caused by many things such as unemployment, debt, loneliness, air pollution, smoking and what you eat and drink. There are lots more causes, but we want to change the things we can have an impact on. Together we have to take charge of our own health, so we can become more independent and self-reliant, such as for people who can work to be employed and stay employed with all the benefits we know that brings. We also need to create better services in the future that fit your needs. This is the reason we embarked on a project we call Taking Charge Together. In December 2015, a project steering group was established with representatives from partner organisations involved in GMHSC devolution, to collectively agree how we might engage with the public about the plans. – specialists in co-creating strategies, plans, insight and solutions through innovative crowdsourcing and physical stakeholder engagements. – specialists in engaging hard to reach, excluded people, their networks and their advocates with specialist support from Manchester’s local Healthwatch teams. – a leading regional radio station and website with a community media bus roadshow capability. – the region’s leading newspaper and web news outlet.